The first week of February was the start of classes at our Bible College. The students learned Inductive Bible Study (IBS) which helps 1.) Them to learn how to study the Word and 2) To motivate them to teach their people through systematic Bible Study. It was encouraging to see that the students were so excited to learn how IBS works. We love to teach Inductive Bible Study because it explains how to teach the Bible instead of people’s personal opinions of what the Scriptures say. Please pray for the students as they continue to study through the Bible. This semester, God has brought many students who are from different tribal people groups from all over Nepal. 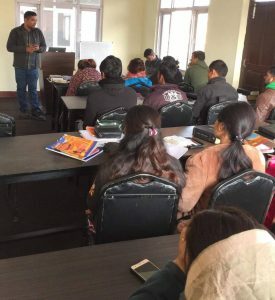 As they attend Calvary Chapel Pastors Training Center & School of Ministry, we can see how they will be able to spread the Word of God throughout Nepal. We know that it is because of the love that God has for this country that He has made this all possible. 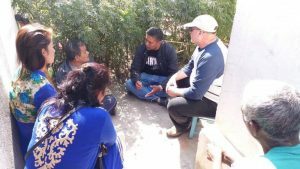 In Nepal, there are 300 people groups who have not heard the Gospel, but God has been bringing some of them to work in Kathmandu and many of them are coming to Christ. A year ago, I started a Bible study in my living room where several of these people have been able to come and hear from the Word. The Bible study has grown and has moved into the Bible College campus where we now meet in a classroom as Calvary Chapel Naku. Please keep the church members in prayer that they would grow in the Word and in their faith. This past month, God granted me the opportunity to teach on the radio from the Gospel of Luke, which is broadcasting to 5 million people in the Kathmandu Valley as well as thousands more who listen on the internet. As you may know, there is a very small percentage of people in Nepal that are Christian. The majority of the population in Nepal are Hindu and Buddhist and most have never heard the Word of God taught verse by verse. There are people listening from all levels of society, including those who are in jail. Please pray that as the teaching of the Word of God is broadcast, lives would be transformed and many would come to know Jesus personally. God is not done with the people who call the Leprosy Colony their home. When we shared the Gospel in the Leprosy Colony last month, a man named Edda gave his life to Jesus! It was evident that the Lord had been preparing his heart for a long time. Edda has a Christian neighbor who has shared with him many times. We know that some sow, some water and we got to see a harvest of souls. All glory goes to God for this new brother Edda. We are so grateful for what God is doing in Nepal. We are investing our lives with many students who have become like family to us. We know it is because of the grace of God poured out on us. It is so amazing that God has allowed me to serve in the Calvary Chapel Pastor Training Center and School of Ministry as a teacher and as a brother to the students and staff as well. Even more than that, I rejoice that God has brought students that we are watching grow in the Word of God, who all have hearts for lost souls. 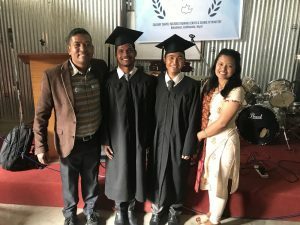 It is a great joy that two students (Majhiya and Raju) have graduated this week. We have seen these students grow. They are zealous for the Kingdom of God.